Many many voices within what is called by men, Christianity, loudly proclaim that we are currently in the last days. Why? Because they believe that the events Jesus foretold in Matthew Chapter 24, Luke Chapter 21, Mark Chapter 13 and The Book of Revelation are being fulfilled. They see the wars and the nations of the world at odds with each other. They read about and see on TV the ravages of earthquakes and famine in the small pockets of the world. They see political officials elected to office and some even proclaim them as Antichrist. These are voices issuing forth from the religious system called Christianity. And, they are dead wrong. Here is why? This temple existed until 607 B.C.E., when it was destroyed by the Babylonian army under King Nebuchadnezzar. When the Israelites were released from captivity to Babylon by King Cyrus of Persia, they returned to Jerusalem in 537BCE to rebuild the temple under the leadership of Zerubbabel of the tribe of Judah. That rebuilt temple stood incomplete for nearly 500 years. It was the buildings of this rebuilt temple that Jesus was looking upon with his disciples at Matthew 24:1-3. About seventy years after Jesus ascended, the temple was destroyed in 70 C.E. by the Romans. Yet, Jesus’ disciples associated the destruction of the temple with his return and the end of the age. It is obvious that Jesus’ return did not occur in the year 70 C.E. and neither did the world end. So, the disciples understood the throwing down of the temple buildings to mean something else. What? It is interesting to note that as you read the question asked at Matthew 24:3, the disciples are asking when will something begin and will that something end. What? Well, since the discussion Jesus was having with his disciples was about the throwing down of the temple buildings and their associating it with the sign of your coming (the beginning of this temple) and of the end of the age (the end of the temple), it is plain that what the disciples wanted to know was when would Jesus return to establish his 1000 year kingdom and when would it end. The world of mankind would have to (1) end before Jesus would come as earth’s king and establish his 1000 year definite kingdom; (2) restore all of mankind to their Creator which will take 1000 years; (3) finish or end his reign as king; (4) and then the age that follows his kingdom, beginning with Satan’s ascension out of the abyss would have to exist for a time span, then that age would have to end. The world of mankind (governments, kingdoms, and all humans) must die out. The world will be devoid of human life for a time span before Jesus returns. The world will be silent. Jesus keeps his promise at John 5:28-29 and resurrects ALL of dead mankind back to life. All of dead mankind restored back to life and they stand up again with earth under their feet inside of Jesus kingdom of 1000 years. This the same paradise that Jesus promised a condemned man at Luke 23:43. Under Jesus’ 1000 year reign over the earth (from heaven), all of mankind is restored to their Creator. All will stand just as Adam did, directly before their Creator without the need of a mediator. Note: This is where many get confused: Jesus’ kingdom is not an indefinite one. It only lasts for 1000 years. Satan had not been destroyed, but only locked up for 1000 years only to be released upon this new mankind that Jesus took 1000 years to restore. It is at this point that things get interesting; and the things the disciples asked Jesus in Matthew Chapter 24:1-3 and the events Jesus speaks about there and in Luke Chapter 21, Mark Chapter 13, and The Book of Revelation take on meaning. What happens when Satan is released after the 1000 years and the earth at that time no longer has The Christ as it’s king? That is the subject of the entire Book of Revelation and 95% of the things Jesus describes in Matthew 24, Luke 21, and Mark 31. He was referring to enduring or standing faithfully during that time period when Satan is released at the end of it. That time period could not be at present because everyone does not hate Jesus’ followers. Why they even hate each other and war with each other. No, this time period would have to be one where the entire world is at one point united and then that entire united world is misled. The only time this occurs is during Jesus; 1000 year kingdom up to the end of it. Then Satan is released to mislead the world of mankind Jesus restored and cause the majority of them to turn again those who will refuse to worship this beast and its image. When will this happen, and what will be the sign of your coming and of the end of the age? The end of the age they understood was not this one, but the one to come: The end of The Messianic Kingdom of Christ when Satan is released. The snare many fall into is that they take the events of Matthew Chapter 24 such as wars, nation and kingdoms against each other, famine, earthquakes as being the sign that signals the return of Jesus and the end of the world. Well, they have not been paying close attention to the question Jesus’ disciples asked him and the answer he gave. The first thing one should note is that this sign is seen in heaven. No, that does not mean that one will look up from the earth and see it. It means that it is an event that occurs in heaven and witnessed by those who reside there: Angels. The second thing to note is that this sign refers to the beginning of something because Matthew 24:30 says the Son of Man coming on the clouds of heaven. This beginning is the coming or return of The Christ. If he comes with power and glory, then he comes as a king. In other words, the sign is the coronation of Jesus as king and the beginning of his 1000 year reign over the earth. Some might think since Matthew 24:30 says “ALL the peoples of the earth will mourn when they see the Son of Man coming on the clouds of heaven, with power and great glory” means that they will literally see him. No, that is not what that means. One of Jesus’ first official acts as king is to resurrect ALL of mankind. (John 5:28-29). When this happens, ALL of mankind will know who resurrected them from the dead. How? Because Jesus says it will be his voice that the dead will hear when he calls them out of their graves. So the mourning that is to occur is not a mourning of dread, but of elation and happiness. What Time Period Are We In Now? Scripture makes mention of a time period called The Appointed Times of the Nations or the Times of the Gentiles (Gentile Times). This is a time period where the descendants of Noah’s son Japheth will hold power and dominion over the earth. Contrary to what many have been taught, a Gentiles is not persons who are not Jews. A Gentiles are the nations of mankind who descended from Noah’s son Japheth. Read Genesis 10:1-5. Also, read my in-depth article Who Are Gentiles? Japheth is the progenitor of the European nations of people. These nations hold the power today. It is a time of men. It is a time of the Gentiles that we are in now. All one has to do is look at the events in the world to see this. The most powerful nations on the earth today – United States, Great Britain, France, Germany, Russia, etc are of Japheth. 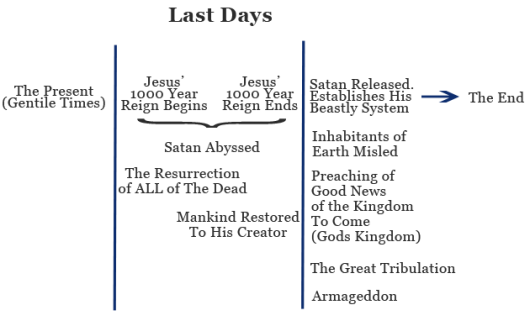 This time period will pass and the next one after it ends will be Jesus’ 1000 year Messianic Kingdom. The time period called the last days is not at present. It is far into the future. It begins with the ending of Jesus’ 1000 year kingdom and the beginning of Satan’s beastly rule. Previous ArticleDoes The World Have a Golden Calf? You mention that the world will be silent in your first point, quoted below. Do you have an article on how it is that everyone will die? 1. The world of mankind (governments, kingdoms, and all humans) must die out. The world will be devoid of human life for a time span before Jesus returns. The world will be silent. I will dedicate an article providing details on this topic. Many will reject it because they refuse to believe that the entire world of mankind MUST pass away. God and Christ both spoke of it. Think of it this way: There existed a “WORLD” long ago. It was the the “WORLD” of Noah’s day. That world was destroyed. The “WORLD” was slient. There was no “human” life short of Noah and his family. ALL of the world will be SWEPT AWAY. That is, die. Jesus set that example by his death as a human. He had to die BEFORE he was allowed entry into heaven. No human will have an experience unlike his. If they DO, then they would be GREATER than the Master. No slave is greater than his Master. If Christ died, so must we. If he was resurrected, so will we. The Pharisee Nicodemus did not understand Jesus when he explained this to him. The world today does not get it either. Jesus was referring to persons being RESURRECTED from the dead. Being Born AGAIN implies having lived ONCE and dying ONCE. To be born AGAIN means being given life AGAIN. That is the promised resurrection Jesus said ALL will have at John 5:28-29! Thus, in order for one to even “see” (not enter, but to see) God’s Kingdom, they MUST literally die and Jesus literally died. The world today is in a Nicodemus state of understanding about what “Born-Again” is. I wrote an article on the blog addressing Hell and The Second Death and what they are. (They are NOT the same thing). I will write an article within the week giving you MANY MORE DETAILS about the world being “silent.” The “silence in heaven” is tied into the “silence” on earth. Silence on earth, no one is speaking or breathing. It will a dead planet (as far as humans are concerned) UNTIL Christ – who died for mankind – brings ALL persons back to life. Christ is the FREE GIFT God gave the world. A FREE Gift has NO CONDITIONS attached to it. Sadly, Christianity teaches a condition: Acceptance of Christ as Lord and Savior. This is false. Christ promised a condemned man, paradise. That man was not his follower. Christ asked forgiveness for his persecutors and executioners. They were not his followers. Whether one accepts Christ or not does not change the fact that he died for ALL persons PAST, PRESENT and FUTURE. ALL – true to his PROMISE at John 5:28-29 – WILL hear his voice and stand up on their feet again – alive. “Christianity” does not like me. 🙂 It does not like what I write because it goes against it’s comfort zone and it agitates it. This agitation is the effect of Christs teachings: The truth. BTW, the Word of the Almighty is clear that there will be a New Heaven and a New Earth Revelation 21:1, and this does tie in with 2 Peter 3:9-14, as well as Mark 13:31…so it appears that the earth will be silent because it's a part of the Master's Plan! It would also appear that while the earth is silent, preparations will be made to make it new so that when the resurrection takes place, the sheer destruction and ruining of the earth from mankind will have been reversed so that mankind can start off fresh…just some quick thoughts. Please take care as to who you identity as the “Word of the Almighty.” I have written in detail on this blog that “The Word” of the Almighty God is a “person” and NOT a book. That person being His Son. Too often do persons “casually” mention God’s word and what they are really saying is that “The Bible” is the Almighty Word of God. That would be a grave mistake. I am fully aware of everything written within the book – called by men – The Bible. I am especially well versed in The Book of Revelation as I view it as “purely” from God by virtue of what is stated at Revelation 1:1: A revelation by Jesus Christ that GOD GAVE HIM. 2. Compare Matthew 24:3 and Matthew 24:30 (Disciples ask Jesus a question about “the sign” his return and the end of the age. Jesus answers their question at Matthew 24:30 and gives “the sign). 3. That sign at Matthew 24:30 is NOT seen on earth. It “appears in heaven.” No one on earth will see that sign because all of mankind will have died out BEFORE Christ returns. When Matthew 24:30 mentions “the sign” appearing in heaven, it means only those who reside in heaven will see it (angels). Why does “the sign” appear in heaven? Because that is where the Master Christ presently resides. It is in heaven that Christs coronation as king over the earth occurs. The Most High God is the one who will give Christ his kingdom of 1000 years over the earth. All of the angels (including Satan) will witness that event in heaven. Once Christ is given his kingdom over the earth, he can (as king over the earth) resurrect from the dead “his property” – ALL of mankind. 5. ALL of mankind since Adam (to include Adam) will have been resurrected back to life again to stand upon their feet and breathing air on the earth. ALL of mankind (untold billions which man man can count) will exist for the 1000 years within Christs kingdom on earth. This is the same paradise Christ promised the condemned man at Luke 23:43. A vast majority resurrected will have no clue as to who teh Son of God is. They will learn though and obviously reason if he was able to resurrected them from the dead, he MUST BE someone important and from God. 6. Christ locks up Satan for 1000 years before he begins resurrecting ALL of mankind. (The exact same duration of his 1000 kingdom) This is so Satan will not be able to interfere with Christs adminsitration over his kingdom. 7. The primary purpose and reason why God will give Christ a kingdom of 1000 years is to prepare His Creation (mankind) as a bride to receive what will comes down out of heaven: The PERFECT Kingdom of God. No one among mankind is perfect (even when they are resurrected) and worthy to receive and enter God’s Kingdom when it comes down to the earth. (The New Heavens and New Earth you referred to is the coming down out of heaven to the earth, God’s Kingdom. It is a marriage of God’s Kingdom and a NEW righteous and perfect human society (earth) that Christ will have taken 1000 years to prepare. 8. Christs kingdom over the earth MUST end. (Rev 20:7). His job completed. He will have restored ALL of mankind to perfection worthy of receiving and entering God’s Kingdom that will soon come down. BUT … something else has to occur first … A TESTING. 9. When Christ’s Kingdom of 1000 years ends, the “restored” world of mankind will no longer need a Savior or an intermediary between God and mankind. Mankind in those future days will be as Adam was. Adam did not have an intermediator or mediator, he spoke with God (his Creator directly). This will be the case of “restored” mankind after Christ Kingdom ends. 11. That future world will be FULL of persons who Christ hasd previously resurrected. The world will be so full of people that Rev 20:8 says their numbers cannot be counted are are “as the sand of the sea.” Who can count the sand of the sea? No human can. WE DO KNOW what the earths poulation is at present. But know one knows how many persons were born since Adam. This shows that Christ will have resurrected ALL persons born since Adam. 12. Satan, when he is released, will see a paradise world. Not to different from the one of Adam’s day except it is full of persons like Adam and Eve: Perfect. He will see persons of all racial make ups (nations, not countries) living at peace among themselves. Christ, their former King, will have taught them well. Satan will “slightly” distrupt that peace and harmony by bringing up with him a Beast. 13. This beast is a government or kingdom over the earth. It is Satan’s government and kingdom that he will “subtly” impose upon that future world. In fact, Satan’s beast (kingdom) will not drastically change what Christ took 1000 years to create. He will use it to his advantage. Many will not know that anything has happened. It will be s subtle change. The world of mankind in those future days will LOVE those changes. (Rev 13:3-4) Satans throne will exist for some time over the earth. It could be 10, 20, 50, 100 years or more. Why? Because it has to be “established.” It takes time to establish anything. 15. Satan also knows the coming down of that New Heavens (government over the earth) means his destruction and the ending of his beast (government). 16. An angel (one powerful angel – who I believe is Christ) will declare to that misled world what Christ mentioned at Matthew 24:14: The Good News of the Kingdom. That kingdom message will not be declared by any human and it has nit been given. Rev 14:6 shows AN ANGEL being entrusted to preach and declare the kingdom message to that future world (which consists of all persons ever born, so ALL will hear it). 17. That message will awaken some who were misled. Many will not respond to that message and will prefer their “peaceful and safe” world under the beast. Those persons will turn on their former brothers betray them and have many of them killed. (Matthew 10:22). But those who remain faithful pass the test – The Great Tribulation – will be saved for entry into God’s kingdom when it comes down (expands) to the earth out of heaven. 19. The contents of the entire book of revelation has not had a start of being fulfilled yet. The Book of Revelation is ALL ABOUT WHAT MUST SHORTLY TAKE PLACE AFTER SATAN IS RELEASED AFTER CHRIST ONE THOUSAND YEAR KINGDOM ENDS. That is what Christ is telling us. 20. In fact, if one goes back to Matthew 24:3 and look at the question his disciples asked him, they were not only interested in WHEN Christ kingdom would BEGIN (his coming) but ALSO when “it” would end. The Apostle John was present at Mathew 24:3. The Apostles would have been interested in the ENDING of Christs kingdom because they would want to know what happens afterwards. 21. Matthew 24:3 is not as “Christianity” says. It is NOT about the end of this world. This world of mankind will have died off before Christ returns as king to resurrect it. 2 Peter 3:9-14 and Mark 13:31 (also Rev Chapter 21) affirms what MUST come in future days: The promise of God’s everlasting Kingdom to the earth: It is a New Heaven (government over the earth) with a NEW Earth (a faithful, perfect and righteous) human society as it’s subjects. The old heaven (human rule over humans) and old earth (unfaithful, blemished and unrighteous) human society will be a thing of the past and will never be seen again. Christs coronation as King by God (the sign) could occur at any time. That means human society today could die off by an unexpected means. No one but God knows. Jesus warned us at Matthew 24:36, Matthew 24:42, and Acts 1:7 that no one knows when he is going to return. But mankind MUST die BEFORE Christ returns (turns his attention) to the earth to call us ALL out of the grave. Again, that is why is coronation (the sign) appears only in heaven and not on earth. We will be dead. The people of Noah’s day were unaware what was about to happen to their world and them. It was only when it began to rain as it did, that they knew that what Noah was telling them was true. But it was too late; they ALL died. God coronates a king over the earth and he resurrects those he gave his precious life for to live again into his kingdom on earth. Jerome you basically just agreed with what I said, but took the scenic route. I repeat, the world being silent is part of the Master’s Plan (Yah’s Plan)… and I was simply indicating that the old must be swept away before the new can be ushered in…Your step by step synopsis simply further illustrates what I said 🙂 … I’m aware of who and what the Word is…my whole point is, the silencing of the world (everyone going to sleep you might say) will be done through Divine Powers so that things can move through their cycles and we can get to the New Heaven and New Earth… I’ve read much of your blog, so don’t use your valuable time to repeat yourself, because much of what you’ve written I believed prior to landing on the site :)…and I thank you for your writings. We are not in agreement with what The New Heavens and New Earth are. Lastly (and respectfully) this is MY blog. I cannot allow persons to dictate what, how, or how much of my time I use to “repeat” myself. I have seen “others” do this and was a way to insert a measure of control of what others say or write. It could also be interpreted as condescending and “I know better than you” mentality. (I do not think this the case with you, but I do not know you well enough to know this). However, I must maintain control over what is mine. This blog is mine. It’s like someone entering YOUR house and telling YOU how to arrange YOUR furniture or how to raise YOUR kids. One should never do that because it is an encroachment – though unwittingly. One should never tell someone else that “their” time is valuable. How can anyone know about “my time” and how I use and manage it? Only I know that. I appreciate you reading my writings. The Almighty purposes…but he does plan. Definition of Plan – an intention or decision about what one is going to do. (End of definition). If he does not plan then he does not make decisions…not how silly is that? Of course he plans… does everything have to be a huge word battle? First off, I'm sorry that you've taken my comments in a way that would have you respond as you have (above). The blog is yours, but this is the World Wide Web and you have made it open to the public for comment. I'm not here to control your writings, topics or anything for that matter. I was simply opening up a dialogue, however you may have taken my comments in a way they weren't meant to be taken. I'll refrain from further comment so as not to be accused of any wrong doing. I do hope you learn to be more hospitable in the future towards commenters and visitors with questions and heart-felt commentary that they desire to make known. In ALL of Scripture you will find the expression “plan” with reference to men and his designs. Yet with God, it is NEVER a plan, but a purpose. Each time “plan” is mentioned in Scripture (about 16 times) it is with reference to men. Purpose is mentioned about 97 times and it is ALWAYS with reference to God. Sometimes we allow “human” definitions define God. Big mistake. Man plans things, God purposes things. The question is: Do our plans harmonize with God’s purpose. When anyone says that God plans, they bring God down to a human level; as a someone who is indecisive and unsure. Your comment about my statement that God does not plan is “silly” I will take lightly as from persons not understanding that God is not human (one who plans) but who is The Most High God who does NOT have to plan, but simply purposes. I am trying to recover from the laughter of how you so eloquently acted as if I don’t know that the Almighty isn’t human… good one, but don’t put words in my mouth. Plans have to be enacted to fulfill a purpose, if the plans have to be altered the purpose remains the same (when speaking of the Most High) but the plans do not. I whole heartedly agree that the Almighty’s does indeed purpose things and that whatever he purposes does not change… his purposes are always fulfilled. However I simply ask you to consider this, the Almighty has changed his plans in order to fulfill his purposes. Everything that is designed was done so according to a plan, e.g., DNA… I don’t want to go round and round, because its fruitless. Does the Almighty design, think, create and calculate, of course. Did HE create man according to HIS plan, yes HE did. Has HE used even HIS enemies to fulfill his purpose according to HIS plans? Yes…תכנית (Hebrew for Plan)… HE most certainly does plan. The tabernacle was built or assembled according to a plan… Whose plan? The Ark Noah built was according to whose plan? Whose measurements? Spare me the long drawn out answers that make it seem as though you’re always right, because I’m not speaking of the meaning of English words, although it wouldn’t matter, the record is clear in Hebrew (Paleo) or English — regardless. The Almighty does not make decisions for us, which is why HIS plans have changed, but HIS purpose will still be fulfilled. Or maybe the earth and all its inhabitants are perfect and just maybe this system and all of the suffering was his purpose all along (no way)… Or could it be that decisions made by humankind exercising their free will caused a change in HIS original plans, but not HIS purpose for humanity? I have no clue about what you are talking about. Not whatsoever. Your comment is how YOU feel. What do you want me to do? That is is how YOU feel. I don’t feel or believe that way. I am not going to get angry at someone because they do not view matters as I do. This is not a dictatorship as “Christianity” would make it. You appear to want to fight and that is not what I am about and it is not the purpose of this website. I am far too mature for such foolishness. My love and respect for my Masters teachings demand that I NOT engage in such “waste-of-time” exchanges. I am NOT writing exclusively for you. I write for the benefit of all who visit this website. My responses are the benefit for all to see. So “sparing you” with long drawn out responses is really another way of saying that you cannot stand the heat. So your natural response is to become agitated and go “personal.” Something I have addressed time and time again on this website that those groomed and indoctrinated by “Christianity” cannot help themselves from doing. If my writings agitate you, why put yourself through reading and responding. I am going to continue what I have been doing: writing as I have. I am not seeking your approval or agreement. I don’t even know you. Yet, I welcome all commenta and do not censor any. Even yours.